How safe are dental x-rays? How often should they be taken? Dentists are careful to minimize the exposure of patients to radiation. With contemporary safeguards, the amount of radiation received in a dental x-ray examination is extremely small. The risk is negligible. In fact, dental x-rays represent a far smaller risk than an undetected and untreated dental problem. How often x-rays are taken depends on your individual health needs. The schedule for needing radiographs varies according to your age, risk for disease and signs and symptoms. Your dentist will review your history, examine your mouth and then decide whether you need x-rays and what type. If you are a new patient, your dentist may recommend radiographs to determine the present status of the hidden areas of your mouth and to help analyze changes that may occur later. Recent x-rays may be needed to detect new cavities, to determine the status of gum disease, or to evaluate growth and development. Children may need x-rays more often than adults. This is because their teeth and jaws are still developing and are more likely to be affected by tooth decay than those of adults. How does Digital Radiography (Digital X-Rays) work? 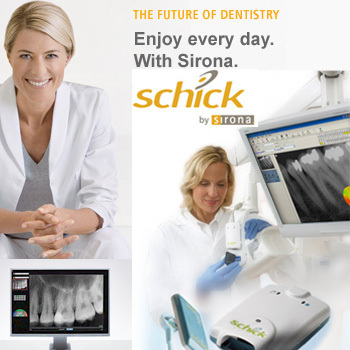 Like traditional film-based X-Rays, we place a sensor from Schick technology which is attached to our computer-based imaging systems. This sensor is about the same size and shape as a film target. We also adhere to all required shielding techniques to protect areas of the body that are not being imaged. After a short pulse from the X-Ray unit, the image is captured by the sensor and sent to the computer for immediate diagnostic review. In all instances, Dr. Hardy will be able to pull up the X-Rays on the flat panel monitors at each chair to explain any concerns and discuss treatment options. Why do we use digital X-Rays instead of film? Major advances in dental technology over the past 15yrs have lead to a revolution in patient safety and the overall general health of our staff and of the doctor. We take great care to make sure we minimize uneccessary expure for you and your family while reduce harmful and dangerous photochemicals from entering our office and creating additional chemical waste byproducts that are harmful to the environment. The hazards associated with Photochemicals are often more dangerous than the minimal radiation exposure received from dental X-Rays. Many photographic processes produce toxic gases. Developer Solutions and powders are often highly alkaline and are considered moderatey to highly toxic. They are often associated with severe health problems in the photography industry including skin disorders and allergies. Developer solutions are skin and eye irritants. Fixer solution may contain sodium thiosulfate, sodium sulfite and sodium bisulfite along with potassium aluminum sulfate as a hardener and boric acid as a buffer. Fixer solutions slowly release sulfur dioxide gase as they age. *The patient receives a lower dose of radiation than with traditonal film x-rays and since the images are more accurate and immediate we tend to not have to re-take as many images as with film. *We get higher resolution images that can be enlarged for clarification and stored as part of your electronic dental records for better diagnostics and patient history. *We can quickly share the x-ray image with the patients in the procedure room while reviewign treatment plan options and answer questions and concerns more thoroughly. *There are no toxic chemicals creating a risk to our staff, patients or the enviroment. *Digital X-Rays can be downloaded and shared with specialists without requiring duplicating film or special equipment. *Digital X-Rays are instant requiring less time spent waiting for someone to develop the images and more time spent on patient care. *Digital X-Rays can be submitted with dental insurance claims to expedite the process.